I hang out in a number of online spaces looking, listening and learning. I’ve tried to capture so much of what I’ve learned on my parenting journey in this space. I’ve tried to be transparent about the things I’ve done well and the things I’ve failed at miserably. Sometimes, I really sit and think about how naïve I was when I first started. I had read a few books and read a few blogs, but boy was I green. I also remember people asking me was I ready to be a parent, as though choosing to adopt assumed greater preparation than having a biological child. I often responded, “Hell no, of course I have no idea what I’m getting into.” I mean, I took the PRIDE classes. I went to pre-adoptive support groups and listened to parents talk about their journeys. But, let’s be serious…are you ever really ready to be a parent? I’ve learned a lot about therapeutic parenting and connected parenting and racially conscious parenting (the only one of which seemed intuitive to me). I’ve learned about adoptee voices. I’ve learned about other adoptive parents. I’ve sucked up a lot of info, and I’ve constructed a weird calculus to value each of the voices and info dependent on the situation. And you know what? I’m still just an average bumbling parent. No better and no worse than any other average bumbling parent. But it seems that the glare of observation and expectation seems so much brighter on adoptive parents. I don’t mean to pull out a mini-violin and whine or anything, but the parenting pedestals seem so much higher and the ravines we get dragged through seem so much lower. On one end of the spectrum, folks tell me I’m so awesome for *saving* Hope, insinuating that Hope should be grateful for our adoption. On the other end of the spectrum, the few vocal adoptees who mistake rudeness and toxicity with “reality” see and point out every parenting flaw I make and drive me into silence for fear of revealing just how average, or below average my parenting might be. There is no grace on either end. There hardly ever seems to be a middle ground, despite the reality that Hope and I are getting closer to whatever normal is every day. I work very hard to be a good parent to Hope, and most days I feel like I am doing just ok. My end game has been if I am able to do more than simply keep her alive and as functional as she was when she came to me then that would be a version of success. Of course, I hope for so much more than that, but parenting is absurdly hard. If it would make parenting easier, I would probably do a few more dissertations, and that was no walk in the park either. 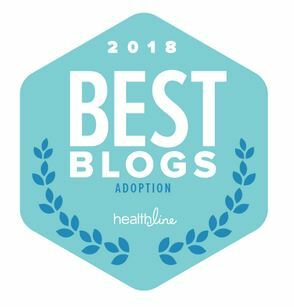 I recently read a blog by an adoptee who wrote a pretty extensive list of things she wished her adoptive parents had done before choosing adoption. I felt really convicted because there seemed to be so little on that list that I had done; I just didn’t know. I was ignorant. And while I often don’t cut folks slack for their ignorance, I’m not sure how I could’ve ever known then what I know now. Even if I did know all that I know now back then, I’m not sure I would have applied it in the way my daughter would have appreciated. Parenting is an evolutionary activity. We grow through it. We learn; we try to get it right. We often fall short. But my God, we try. I remember in my early 20s rambling off a lengthy list of my parents flaws and foibles. Oh, they were true, and they probably served as barriers to their parenting perfection, a perfection that was and is elusive on a good day. I know better now. I see them as not just my parents but as people who, remarkably, had lives outside of me and my siblings. They did their best, and that was more than ok. They were and are amazing parents. I know that without any doubt; I see it so clearly. I try to emulate them with a therapeutic spin. I try my best, and I hope that it is more than ok.
On the outside, adoption is rainbows and sparkles. On the inside, it can be very dark and tumultuous. Folks rarely gets to see what happens behind closed doors where everyone is fighting for survival. I do my best to fight with my daughter instead of against her. I fight for her. I try to apply every lesson I learn. I replay every family squabble to assess how I could handle it better. I try to provide every possible resource that I can access and afford. I problem solve as much as I can. I try my very best to be a good parent to Hope. And if I’m lucky, I’m average. That’s real, and that’s ok. So, whatever kind of parents we are, I hope that we can practice more grace with one another. I hope that Hope sees me as I am one day. I imagine that she will find that my parenting fell far short of what was needed or desired, but I also hope that as she continues to grow and evolve that she will know that I did my best not make things harder than they already were for her. I hope that as she lists the things I missed or failed that she will also see the things that I manage to get some kinda close to right. I hope that she will see me through lenses blessed with a bit of rosy grace. That would be nice. If she doesn’t see me that way, it’s ok. It really is. This entry was posted on Thursday, February 23rd, 2017 at 9:16 pm	and tagged with adoption, adoptive parents, African American Adoption, African American Parenting, Lessons Learned, Parenting, Parenting support, Parenting Teens, Parents and posted in Finalization Life, Lessons Learned, Parenting. You can follow any responses to this entry through the RSS 2.0 feed. Cheers to average!! Sometimes, when I feel especially bumbling, I remember that the youngest children in a family don’t regularly come out better than the oldest. Sometimes they do, but on the whole, the evidence seems to show that even after having direct experience as a parent (older siblings), we don’t do a BETTER job with younger siblings…we just bumble along for a second, third, time. That tells me there is little that can adequately prepare us, so we just have to do the best we can! I hear ya! When my daughter was a teenager, she regularly told me where I was screwing up – too strict, too mean, too rigid. Then at some point during her 20s I remember driving in the car, and she treated me to a new dissertation, about how her life would have been so much better if only I’d been more strict about enforcing boundaries. Finally, in her 30s, she has decided that actually I did okay. I’m glad of the pat on the back … but you’re right – whatever she thinks, it really is ok. We survived. We have some good memories. She’s grown into her own person, who happens to be someone I like and respect. It’s okay. I agree average is great. I bumble a lot as well but as long as my daughters can see I am learning from my mistakes and eventually come to a place where they don’t hate so many of the decisions I made, then it is a win. This. This this this this this. I’m also the adoptive mom to a tween (she hates that word) and I’m not sure even if we were doing it perfectly that we would know from their behaviour! 🙂 The whole point of being a preteen is acting out, from what I recall of my own years. I feel like I can’t kvetch about her behaviour to my friends who are bioparents because some of them already see her through a “dangerous product of the foster system” lens, and I don’t want to give them fodder for their suspicions. We are not superhuman and it’s about time we cut ourselves some slack. Yes. Just yes. How many people would give new moms the side-eye and say “you chose to do this” or “maybe you should give her back” if she had just given birth to a finicky baby. Sheesh. Every parent does their best.